Now you can fight the War of the Apocalypse from its earliest days. 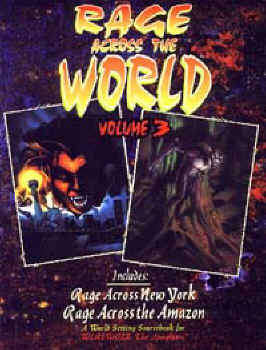 Rage Across the World Volume 3 is a compilation of two classic Werewolf sourcebooks: Rage Across New York and Rage Across the Amazon. Previously out of print and almost impossible to find, these books are now repackaged under a new cover.